Saw a beautiful piece of top round beef last time I went grocery shopping. Knew I couldn't get to it in a timely manner, so I wrapped it well and froze it. Bring the beef to room temp! Guess what – if your meat isn't all the same temp when you start, it won't cook evenly. Even for my relatively small roast, this can take up to two hours - so I used the time to my advantage. I gave it a nice coating of coarse kosher salt (maybe a Tablespoon for my three pound piece), and let it sit on a rack over a pan for the first hour. Lit the grill and seasoned. That's right – I'm using the grill instead of the oven. Why should I tax my A/C any more? I've got two controls for my gas grill, so I turned one side up to medium and left the other side off. While that was heating (shooting for 300F with the cover down), I mixed about a teaspoon each of black pepper and garlic powder and did a second coating on the roast. By now most of the salt had absorbed into the meat and the surface was slightly moist, which allowed my simple blend to cling and do 'its thing'. 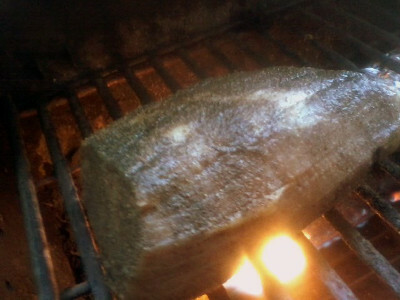 About 30 minutes later, this is what it looked like when I placed it on the hot side of the grill, going for a good sear. Well, yeah, that wasn't a good idea – the flames got a little too big, and the first side charred a bit, lol. Smelled luscious, but... Using tongs so I didn't pierce the surface, we moved to the “cool” side of the grill for about 45 minutes. 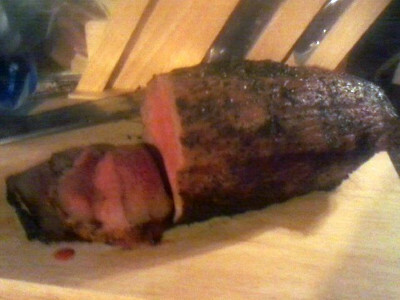 With a meat thermometer, I checked the internal temp every 15 minutes or so – my goal was rare, so 125F (medium= 135F, medium well= 140F... with this cut of meat do NOT go higher!!). The flavors you love in a steak with the ease of a roast!